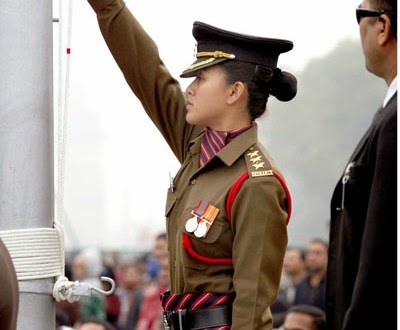 Imphal, Jan 26 : A young Manipuri woman officer, Lieutenant Haobam Bella Devi, will conduct one of the most important and prestigious activities during the Republic Day parade — unfurling the national flag — at Rajpath in New Delhi on Monday. The act will be done in the presence of President Pranab Mukherjee, PM Narendra Modi and the chief guest on the occasion, US President Barak Obama, among other distinguished personalities. "When the President along with chief guest has been seated, the CO of the President's bodyguard gives command for salute. Right after that, the national flag is unfurled and national anthem is played along with a 21-gun salute," said a defence statement. "Lieutenant Haobam Bella Devi of Ordnance Corps has been assigned the duty this year. Lt Haobam Bella Devi, a second generation army officer, is the daughter of Col H G Singh (Retd), of Top Leikei, Singjamei, Imphal," said the statement issued by Lt Col Ajay Sharma, PRO defence (Imphal).